In Liguria, Italy for more than a century Piral has been working the clay and firing its ovens in Albisola. Piral is renowned for its terracotta cooking vessels used in the preparation of some of the finest regional Italian cuisine. This fine, authentic Italian, all natural terracotta cookware is made for stove-tops, ovens, microwaves and is dishwasher safe. The benefits of Piral are it's completely natural materials, environmentally friendly cooking properties and exceptional beauty and versatility. The 1870 Collection is a harmonious combination of ancient methods with the benefit of today’s technology. Simply, it is clay from Italy mixed with water, fired twice in ovens. The 1870 Collection is available in an array of dazzling finishes; it can be taken directly from the oven or stovetop to serve at your table, enhancing your presentation. Clean up is easy due to the “crystalline” glass like finish. It is the true “green” alternative being sought by the consumer today not only in its raw materials, but in the absence of harmful by-products created in the process of manufacturing, unlike many metal pans. 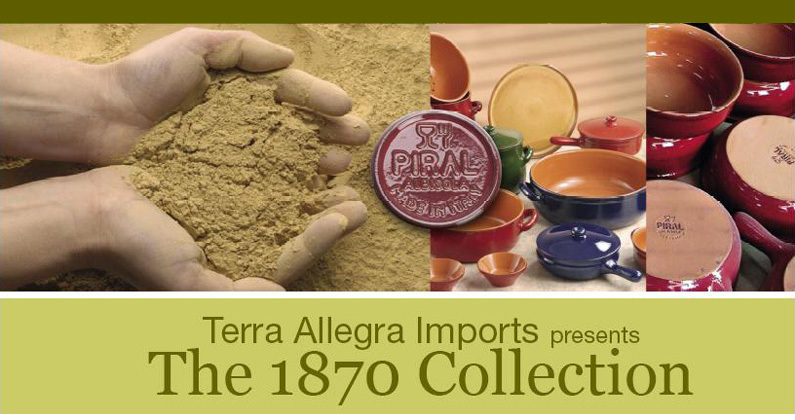 Independent test results show the 1870 Collection is well below California’s levels of acceptability for trace elements. The terracotta cookware can go from your freezer or refrigerator to the oven Most importantly, less energy is required, due to the great heat conductivity of this fine terracotta. These products and many others are now available in our online store.